While the adoption of electricity sourcing from renewable sources has been hampered in the past due to high costs, new research has the potential to make solar energy more affordable. To help reduce manufacturing costs of equipment used for energy generation, scientists have also discovered a new method of producing photovoltaic cells used for solar panels. In analyzing the costs of PV production, scientists aim to boost the competitiveness of domestic PV manufacturing while decreasing energy costs, according to the Massachusetts Institute of Technology. 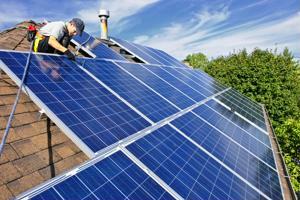 In 2011, China was the global leader in PV manufacturing, making 63 percent of all solar panels. In a study by the U.S. Department of Energy's National Renewable Energy Laboratory (NREL) and MIT, researchers found that China's competitive advantage in PV production is not due simply because of low labor expenses. Researchers created a model in their analysis after accounting for PV manufacturing costs, including materials, labor, equipment and overhead. "It doesn't rely solely on self-reported figures from manufacturers' quarterly reports," said Tonio Buonassisi, an associate professor of mechanical engineering at MIT. "We really took great care to make sure our numbers were representative of actual factory costs." In their research, they pinpointed China's lower prices to supply management and economics of scale. With this knowledge, the United States could improve their manufacturing capabilities of PV modules. However, Buonassisi said that price differences in PV production are not because of "country-specific advantages." Technology could potentially change the pricing of solar panel manufacturing, including spray-on PV cells recently developed by scientists from the University of Alberta, Science Daily reported. In reducing manufacturing costs, the team of researchers developed a technique that can mass manufacturing solar cells using printing or spray-on painting. The group discovered that when used in a way similar to ink, nanoparticle material is able to be made into films that can react to light. The nanoparticles, created from common elements such as phosphorous and zinc are able to absorb light and conduct electricity at a lower cost than a more expensive element like cadmium. "Half the world already lives off the grid, and with demand for electrical power expected to double by the year 2050, it is important that renewable energy sources like solar power are made more affordable by lowering the costs of manufacturing," said Jillian Buriak, chemistry professor and senior research officer of the National Institute for Nanotechnology.